Hey, I haven't ever seen this with my own two eyes except Friday (1/29/10). I was waiting at Hynes inbound and got on a train of what I thought was two type 8's. When I got off, to my surprise it was actually three type 8's all running in series. The destination was Lechmere, which seems odd because the only Lechmere trains that usually run are from the E line, which doesn't even stop at Hynes station. Then later when I was waiting for my outbound E train I saw what I guess was the same train, this time going to Cleveland Circle (the drivers' shift was probably ending soon?). Just thought I'd mention. I know the type 8's can technically run up to 4 cars together (although the platforms are only long enough for 3), but I was still excited when I saw it. Re: I saw a 3-car train? If it was 2 type-8's and a type 7 or something, I'd say maybe one trolley car broke down so they took 1 car and threw it onto another. Wonder if there were any events going on that they needed the capacity for or something. Maybe just a test of how 3 car trolleys run? EDIT: Can 3 fit in Copley?? Possibly. But it could have been a trial run and I'm not sure of any special events. Were the cars in revenue service (ie were there passengers on cars)? I'm not sure if Copley with the current construction has the capacity for a 3-car train to serve the station. 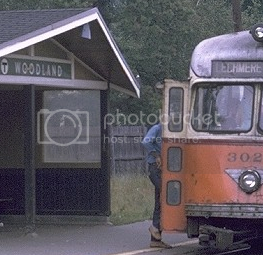 What you probably saw was a non-revenue move to Lechmere from Reservoir via the C Branch to supply the E Branch with the cars that it needs to operate. Lechmere Yard and the Brattle Loop (which also holds BC cars) don't have enough capacity to meet the car requirements of the E Branch. Therefore, 4 (I believe) cars are needed from Reservoir to meet the demand. Late at night, I've seen 4-car sets do non-revenue moves to Reservoir via the C Branch. There's a regular in-service run from Cleveland Circle that's routed to Lechmere every afternoon... I've been on it a number of times and asked the operator about it. Diverging Route wrote: There's a regular in-service run from Cleveland Circle that's routed to Lechmere every afternoon... I've been on it a number of times and asked the operator about it. That could have been it, although it was packed full of drunk college kids, presumably from the B line. Although there are some frat houses in Brookline (C branch), it seems like there were way too many kids to be coming from Brookline. But, I have no proof whether it came from BC or Cleveland Circle, so this could be. Philip Wirth wrote: Were the cars in revenue service (ie were there passengers on cars)? Yes, all three cars were in service!! I was riding it from Hynes to Arlington) although the announcements weren't working. It was just flashing "Destination: Lechmere". The first car was packed full of drunk college kids (from BU/BC? ), the second one a little less crowded, the third car was almost empty (because no one probably knew it was there). When I was at Arlington waiting for my E train, the train came back and I saw someone's jaw drop when he saw the three car train. This was some time around 11:45-12:30 at night. It wouldn't be a trial run, they did this regularly a couple years or so ago when the type 7s and 8s were first being put together. This was before all the type 7s were compatible. You'd usually see 2 8s and a 7 but there were all formations (although I never saw 3 7s). I did see 3 8s a couple of times. This practice was discontinued before they started running the 7/8 combo almost exclusively, and only survived for a short while. This was definitely an oddball move, a nice catch! But these things do happen from time to time. Also, trains can be rerouted on the fly. This usually means cutting the trip by short turning it at Park St. or Gov't Center, but if there was say a problem out on huntington ave halting Heath St. service, they might want to send a Cleveland Circle or Boston College car out to Lechmere so there's not too much of a service gap on that end. CRail wrote: It wouldn't be a trial run, they did this regularly a couple years or so ago when the type 7s and 8s were first being put together. This was before all the type 7s were compatible. You'd usually see 2 8s and a 7 but there were all formations (although I never saw 3 7s). I did see 3 8s a couple of times. This practice was discontinued before they started running the 7/8 combo almost exclusively, and only survived for a short while. They also ran 3-car trains of Boeings for many years, especially on the D line. Did every car have a driver? Weren't they installing monitors and stuff recently? Perhaps a three car train with one or two staff members? 3 car trains have always been "coming soon" but they didnt fit at Arlington and Copley. I know Arlington is 95% done, so does this mean Copley is back to full platform? It must be, or else it wouldnt have been allowed. jamesinclair wrote: Did every car have a driver? I can't remember if Copley is full or not. I should since I pass by so often. I'm pretty sure right now it is a full platform at least on the outbound side. There are plywood walls, but I think the yellow Caution strip and a few feet of platform are available, so technically a 3-car train could be possible. Would that work though? I thought the only thing connecting two green line trolleys together was the couplers, so they wouldn't be able to open/close the doors with just one or two operators. No, otherwise how would they both accelerate and brake at the same time, and have the announcements/destination signs be synchronized? I think there's an electric connector built into the couplers. Yes, there is an electronic link, but the opening and closing of doors is all manual and each car requires an operator. Each car also requires an operator on street level to ensure the collection of fares. Get your facts straight diburning the Type 8 have a door set up switch simular to a rapid transit train, so they can run the train with 1 operator and the doors will be operated by the same. Not sure if they retrofitted the Type 7 with this feature. Any questons refere to the #8 Operators Manual, Breda. diburning wrote: Each car also requires an operator on street level to ensure the collection of fares. Don't you mean to keep the union fat and happy?